Remaking an animated classic as a live-action film seems to be hubris. How can you top Phil Harris, Louis Prima, and even Sterling Holloway singing some of Disney’s most indelible songs? The answer is, of course, that you can’t. Instead of topping it, you have to step to the side and deliver something different while still nodding to the comfort of the classic. In this, director Jon Favreau just gambled and won handsomely. 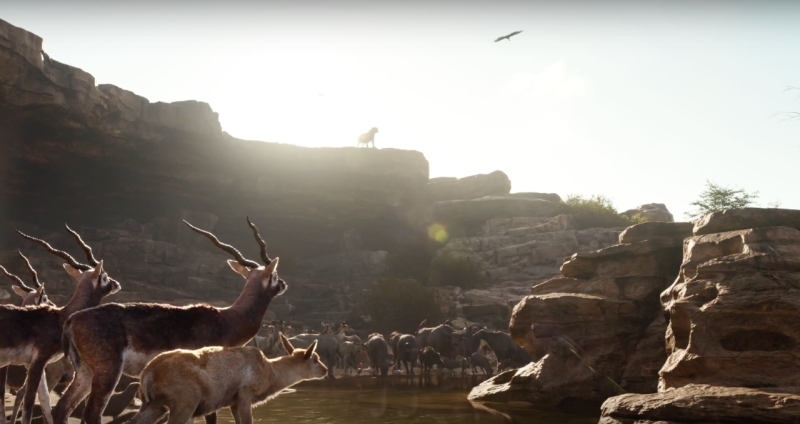 In The Jungle Book (not, by the way, the first time that Disney has remade this in live-action), everything is different yet familiar. Favreau and screenwriter Justin Marks have raised the stakes in a way that 1967 animation simply wouldn’t show. 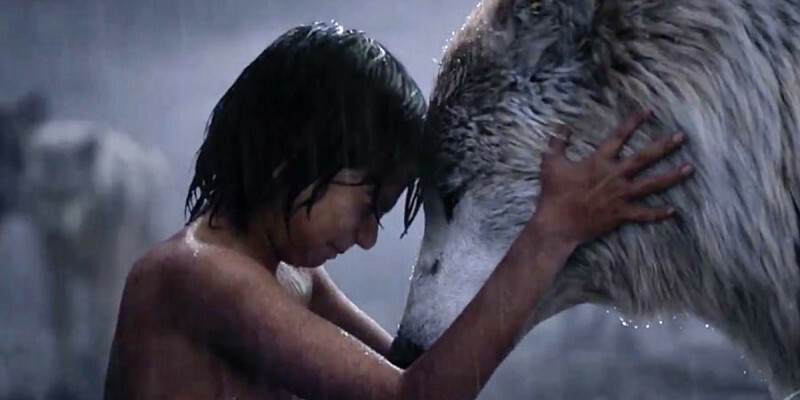 Mowgli (Neel Sethi) still has all the impudence of an over-confident kid who wants to be a wolf, but now he has some scars for it. We also see him earn some of them. For this is the jungle, and these animals are wild, though they have a sense of civilization. In times of drought, they call a truce so that all can have water — a set piece that allows Favreau to lay out (almost) all the denizens of the jungle, large and small. It establishes all the personalities, and Mowgli’s central conflict. He may want to be a wolf, but his own instincts lead him to something more – what his wolf father Akela (Giancarlo Esposito) calls “tricks” — that give him a competitive advantage. Into the truce slinks Shere Khan (Idris Elba), determined to finish what he started long ago when he orphaned Mowgli. Clearly trying to be the “benevolent” dictator of the jungle rather than its king, Shere Khan still does not hold the power of the elephants, who occupy an intriguing place in the outright theology of the animals. This is a film at once deeper than the animated classic while just as crowd-pleasing. Favreau still gives us the moments that have to happen — the songs are still there, a bit at odds with the bigger orchestral score, but fans would have been outraged if they were missing. At least the production changes it up a bit — Bill Murray as Baloo retains the fun of Phil Harris’ rendition of “The Bare Necessities,” but doesn’t take it as seriously. 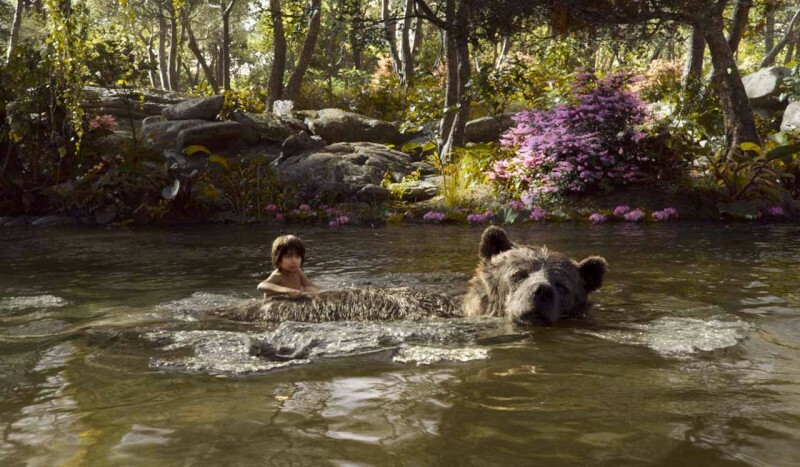 As a result, it actually seems almost organically something that Mowgli and Baloo would sing as they journey instead of being a rehearsed musical number. And in context, Christopher Walken’s King Louie tries to be more menacing with “I Want to Be Like You,” though a more traditional version plays over the end credits, with Walken again on vocals. But Favreau doesn’t just give us the moments we remember, albeit remixed. 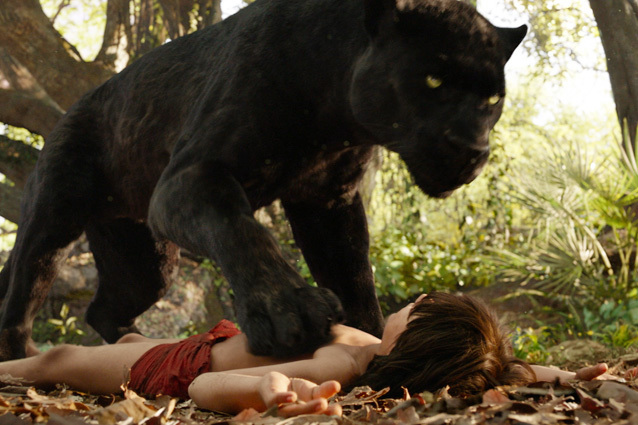 The Jungle Book also feels like a throwback to Disney’s classic live-action films — including True Life Adventures. Animals clash like animals, and these struggles are well shot. Cinematographer Bill Pope frames a few scenes like a technicolor classic, with great depth of field and lush colors. It’s almost heartbreakingly gorgeous. Then you have those performances that have to overwrite memory. Ben Kingsley’s Bagheera isn’t as effusive as the cartoon; instead, this is a staid British panther who represses his emotions for survival. Yet warmth keeps seeping through when talking about Mowgli. It’s a very human performance that complements Murray well. Changing Louie from orangutan to the similar gigantopithecus allows Walken to unleash the menace that really was there all along, if you thought too hard about the animated plot. (And yes, occasionally, we all thought too hard about the plot.) And the digital artists maintain the look of Walken’s eyes — we have made it through the uncanny valley. 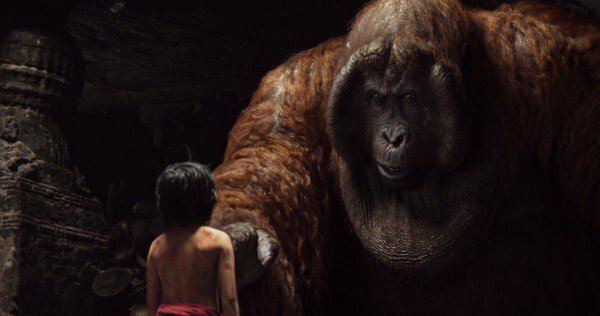 For all its menace, The Jungle Book also remains a good family film. Favreau provides plenty of comedy, taking advantage of the rich variety of animals at his disposal. He also teams up with Sam Raimi and Garry Shandling (his last performance) to voice a cute trio; wisely, Favreau the director doesn’t overindulge the trio and let them try to steal scenes away. This was the impossible project. But Favreau did it. He gave Disney a live-action remake that can stand shoulder to shoulder with one of its most beloved animated projects. This isn’t the “real” story, like Maleficent. This is just the deeper one. Better? No, but in its own way, just as excellent.